1. 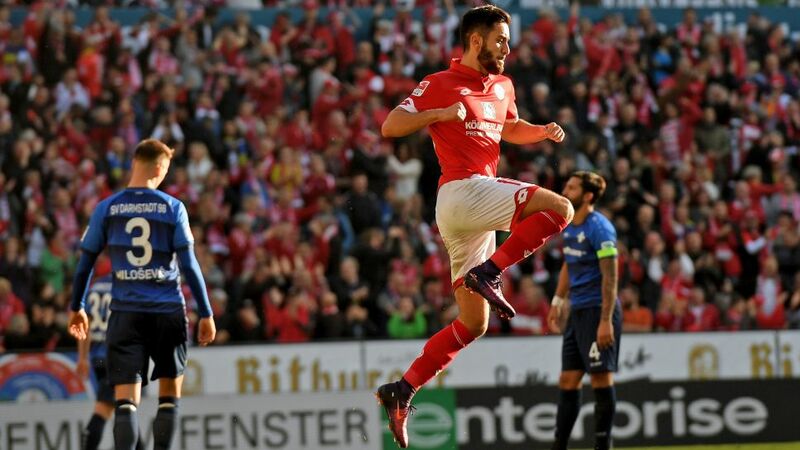 FSV Mainz 05 recorded their first home Bundesliga win of the season in Matchday 7's Rhein-Main-Derby with SV Darmstadt 98. The chances kept on coming for a dominant Mainz side after Pablo De Blasis headed home a Gaëtan Bussmann cross to give the hosts a fifth-minute lead, but a combination of poor finishing, the woodwork and some decent goalkeeping from Michael Esser prevented Jhon Cordoba, Yunus Malli and Alexander Hack from adding their names to the first-half scoresheet. Laszlo Kleinheisler's speculative 18th-minute effort was the closest Darmstadt had come to an equalising goal, before Antonio Mirko Colak saw his tame penalty saved by Jonas Lössl on the stroke of half-time. It went from bad to worse for Darmstadt eleven minutes into the second half as Malli struck from the penalty spot after being brought down by Aytac Sulu to double Mainz's lead. Colak spurned further chances to get the Lilies back into the game, and while Jerome Gondorf did manage to reduce the arrears from the spot in added time, anything other than a Mainz win would have been extremely harsh on Martin Schmidt's charges, who could quite easily have chalked up a cricket score. There is no questioning the quality of Mainz's football, but they will have to improve in front of goal if they are to challenge for a place in Europe. Their profligacy would have been punished by better teams than Darmstadt. De Blasis has already scored as many Bundesliga goals this season as he did in 26 appearances last term (four).Darmstadt have missed three of their seven penalties since returning to the Bundesliga in 2015/16.It was the first Bundesliga match to see the concession of three penalties since 1. FC Nürnberg's 2-1 win over Eintracht Braunschweig on 22 February 2014.